You may or may not have heard. This year marks the centennial of Beisswenger’s Hardware and Power Equipment in New Brighton. Yes, 100 years is a milestone that not many businesses can proclaim. From the turn of the clock on December 31st, 2018 our celebration began. Beisswenger’s now belongs to a list of distinctive businesses that have managed to survive time, turmoil, development, a passing of the torch to the next generation, and still make a positive visible presence in the community. And of course the challenges of continuing to operate as a local, neighborhood hardware store in the days of big boxes. A challenges we gladly accept! The Beisswenger family has played an integral role in the New Brighton Community. The Beisswenger family settled in New Brighton before it was officially proclaimed as a city. 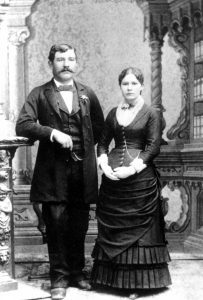 Jacob and Caroline Beisswenger were one of five families that moved into the area, but the first to officially stay. The business itself began like most, a small stand with an idea. They sold their wares at the market before purchasing an old building and setting up shop. What started as a hardware and grocery store has gone through many changes over the years….furniture, appliances, gift shop before currently settling on hardware and power equipment. We are a second generation business with Mark Beisswenger as owner. He loves retail. And, like his father before him, you can still find him at the store almost everyday. So yes, this is a big deal for us. For more on New Brighton history check out this link! The momentum and festivities mount as we approach our centennial anniversary date on June 7th. And, we are throwing a “Party in the Parking Lot” on Saturday, June 8th from 9 am to 5 pm. Stay tuned for more details. If you have questions please contact one of our committee members: Mark Beisswenger, Jim Neumann, Steve Bien, Al Morelli, Dawn Tereau, or Mark Armstead. Every weekend through April we are going to repot your plants for free. Our garden guru Mark, will be here on weekends. You folks can bring in your houseplants and we’ll replant them. You bring the pot and plant and we will supply the potting soil and hands to do it. Don’t have a pot? Choose from our selection! This weekend will focus on the lawn. We have Bill Sproat from Fertilome and Kurt Slade from Twin City Seed in attendance to help. From starting a new lawn, to making sure your current turf stays healthy, we’ve got you covered. We have some great giveaways from both Fertilome and Twin City Seed. Kurt knows his turf, he has degree in turf management and spent over 17 years managing golf courses. For the past couple of years, folks are spending less and less time and energy on their lawns. The University of Minnesota Extension Center is promoting Fescues as a low maintenance lawn and the homeowner is listening. Their are some new fescues on the market and this year we have added this fescue mix to our inventory. The U of Minnesota Bee Squad has also been promoting a bee friendly mix of seed for your lawn. We will have that in stock also! Bill Sproat is our champion of Fertilome products. With Bill’s many years experience in the garden center industry, and years with Fertilome he has seen it all. Last season we experienced all kinds of problems in the lawn: Brown Patch disease, and explosion of crabgrass, nutsedge growth, and annual bluegrass, to name a few. Don’t get discouraged by Mother Natures twists, find out how to curb those problems and get back to what’s more important in life, enjoyment. Beisswenger’s has one of the largest inventories of Fertilome products. You explain the problem and Fertilome has the answer. Do you have a window screen with a hole? Maybe your pet has pawed and scratched their way through it? We are going to put in a new screen for you….free! You get one window screened just for bringing it in! We will do others, but that’s going to cost ya. The only catch is your frame must be in good condition. That’s a petty good catch! Join Robert Hear from Dr. Earth and the Beisswenger’s staff for a day about growing organically. We have some great giveaways in store. Organic fertilizers, weed killers, gift baskets stuffed with tools, Dr. Earth products (and maybe a nice gift card). Bill from Fertilome will be back to talk all things “Fertilome”, this time focusing on fertilizers and plant growth. And of course we will have more giveaways and specials from the folks at Fertilome! Oh what fun we’re going to have! A Centennial in the making! We constantly hear stories from those who have shopped some of the old stores. The old wooden floors, being able to see down to the basement or up to the second floor, and product along every inch. We may be in a newer store but the dedication to you as a customer has not faltered. Festivities will start at 10 am and last until 5 pm. There’s games for the kids, games for adults, a petting zoo, food, drink, ice cream, giveaways and most of all fun! Watch your favorite employees get dunked in the tank of doom! Bring your friends and family! Parking space will be limited as we close off the front of the store. Bailey Nursery is going to send their “Endless Summer” truck….spending the day with us. With Father’s Day just a week away, we’ll have a Hydrangeaganza! At Bailey Nursery, they are all about growing. And they invite you to grow along with them. For over a century, people have relied on Bailey Nurseries to provide the highest-quality plants and unrivaled customer service. They stand behind everything they grow — feet firmly planted in the dirt. And they never make promises they can’t keep. But Bailey is more than a trusted resource for fulfilling customers’ needs. Now, more than ever, they are focused on what’s next —their proprietary plant breeding and trial programs. In the meantime, we would love to hear your stories, get copies of photos from past employees and the Beisswenger business (old and new), the funny antics, and the weird world of craziness. If you see past staff, have them contact us! Beisswenger’s Hardware and Power Equipment has been serving the New Brighton , Minnesota area since 1919! We are committed to providing top notch customer service and great products to the greater Twin Cities area and communities of Ramsey County, Hennipen County, Washington County, and Anoka County of south-central Minnesota. We offer over 67,000 items through our warehouse that can be shipped to your door, or to our store! The Twin Cities is home to many great attractions including the St. Paul Saints, Minnesota Wild, Minnesota Vikings, Minnesota Timberwolves, Minnesota Twins, Minnesota Lynx, Science Museum, Amusement Parks, State Parks, and more.